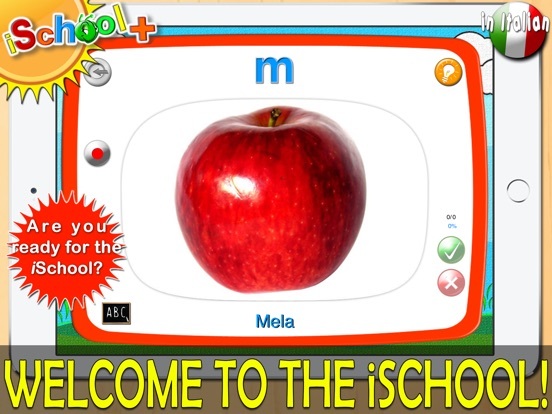 Welcome to the iSchool for iPad! 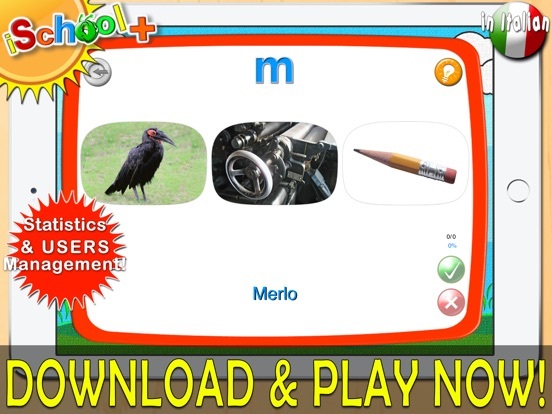 This application was designed to provide an immediate and friendly tool to teachers and parents for teaching the linguistic bases and the pronunciation of words to children in pre-school and school ages. Using a “game” approach, iSchool will help our children in the learning process in a simple and natural way with six engaging activities! There is a vocabulary with more than 1200 words (with different complexity and length) to help the child to develop the ability of association between the word and its sound and image. For each word, in fact, you can hear the pronunciation, display its image and also verify the correct hyphenation. The vocabulary is fully expandable and customizable with the addition of new words, images and voices. It’s possible to create specific training paths, always new and suitable for every educational need. 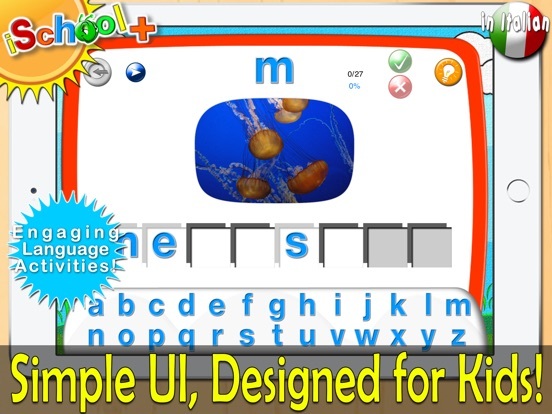 Due to its simplicity and immediacy, the application is also suitable for children with special needs and problems. For example, it’s possible to use the alphabet with the standard symbols for signs in some of the games. - over 1200 target words for the 26 letters of the alphabet. You can easily add your own words to the vocabulary! 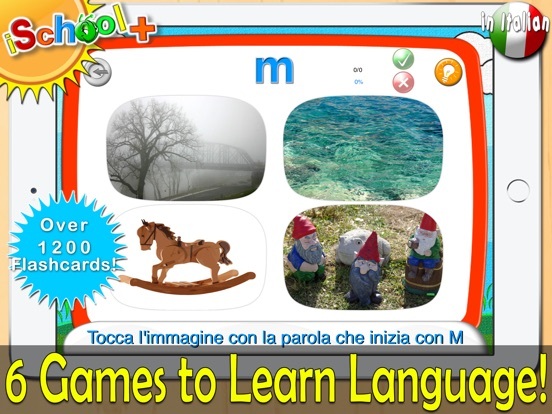 - beautiful images and high quality speech synthesis pronunciation for all the target words to help practice with all the activities with the support of teacher or parent. - flashcards and matching activities. - scoring and data tracking for each child/student. - voice recording and playback feature for monitoring responses and progresses. - includes the alphabet with the standard symbols for signs (US, UK and Italian sets. Additional sets will be added in future). - you can customize the application adding your flashcards: engage your children by adding their voice and pictures to personalize their learning experience. - Flash Cards: look at the picture, examine how the word is written and its hyphenation, listen to the pronunciation, record your pronunciation and check your progresses. - Matching Cards: it’s a memory game in which you must pair pictures equal to each other. Every picture has associated its word and it’s possible to listen to the pronunciation. - Find the Card: select the correct picture whose word is starting with the indicated letter. If correct, you’ll hear the word. 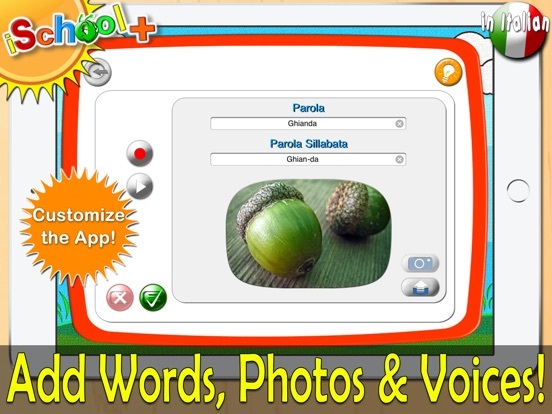 - Drag & Drop: drag the word on the correct picture and listen to the pronunciation. - Compose the Words: using the letters of the alphabet you should compose the word relative to the picture shown on the screen. Check the correct solution and to listen to the pronunciation. - Crosswords: the game is similar to the previous one, but now you have to find two words that have a letter in common. *** IMPORTANT: this is the Italian version of the app. A full English version is available on the App Store! Additional versions for other languages will be available soon.